Should dimensionality reduction for visualization be considered a “closed” problem, solved by t-SNE? I've also used it to visualize the features learnt by a neural network I'm training and I was very pleased with the results. $t$-sne has good results on most datasets, and has a pretty efficient implementation - $O(n \log n)$ with the Barnes-Hut approximation method. Then, could we potentially say that the "dimensionality reduction" problem, at least for the purpose of creating good 2D/3D visualizations, is now a "closed" problem? I'm aware that this is a pretty bold statement. I'm interested in understanding what the potential "pitfalls" of this method are. That is, are there any cases in which we know that it is not useful? Moreover, what are the "open" problems in this field? many t-SNE's properties are still poorly understood. Barnes-Hut runtime is too slow for large $N$. I will briefly discuss all three below. t-SNE often fails to preserve global structure of the dataset. Non-neural cells are in grey/brown/black. Excitatory neurons are in blue/teal/green. Inhibitory neurons are in orange/red/purple. One would want these major groups to stick together, but this does not happen: once t-SNE separates a group into several clusters, they can end up being positioned arbitrarily. The hierarchical structure of the dataset is lost. I think this should be a solvable problem, but I am not aware of any good principled developments, despite some recent work in this direction (including my own). With 1 mln data points, all clusters get clumped together (the exact reason for this is not very clear) and the only known way to counter-balance is with some dirty hacks as shown above. I know from experience that this happens with other similarly large datasets as well. 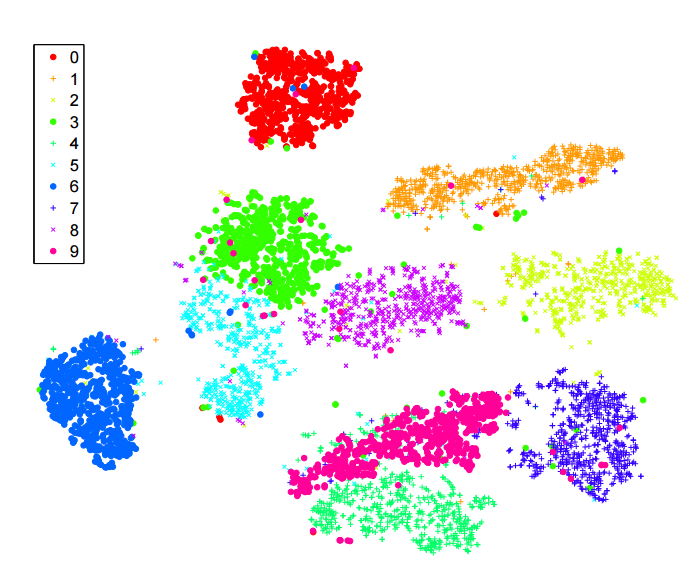 On the right is t-SNE. On the left is UMAP, a new exciting method under active development, that is very similar to an older largeVis. UMAP/largeVis pull clusters much further apart. The exact reason for this is IMHO unclear; I would say there is still a lot to understand here, and possibly a lot to improve. Vanilla t-SNE is unusable for $N$ over ~10k. 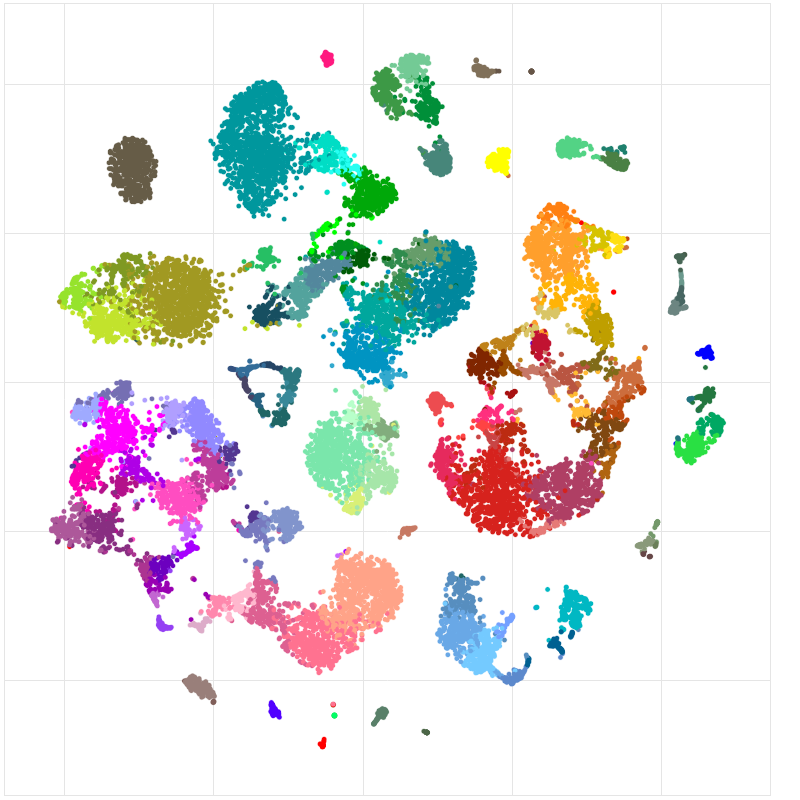 The standard solution until recently was Barnes-Hut t-SNE, however for $N$ closer to ~1mln it becomes painfully slow. This is one of the big selling points of UMAP, but actually a recent paper suggested FFT-accelerated t-SNE (FIt-SNE) that works much faster than Barnes-Hut t-SNE and is at least as fast as UMAP. I recommend everybody to use this implementation from now on. So this might not exactly be an open problem anymore, but it used to be until very recently, and I guess there is room for further improvements in runtime. So work can certainly continue in this direction. Here's an excellent analysis of how varying the parameters when running t-SNE affects some very simple datasets: http://distill.pub/2016/misread-tsne/. In general, t-SNE seems to do well at recognizing high-dimensional structures (including relationships more complex than clusters), though this is subject to parameter tuning, especially perplexity values. t-sne cost function is not convex, so we are not guaranteed to reach a global optimum: Other dimensionality reduction techniques (Isomap, LLE) have a convex cost function. In t-sne this is not the case, hence there are some optimization parameters that need to be effectively tuned in order to reach a "good" solution. However, although a potential theoretical pitfall, it's worth mentioning that in practice this is hardly a downfall, since it seems that even the "local minimum" of the t-sne algorithm outperforms (creates better visualizations) then the global minimum of the other methods. curse of intrinstic dimensionality: One important thing to keep in mind when using t-sne is that it is essentially a manifold learning algorithm. Essentially, this means t-sne (and other such methods) are designed to work in situations in which the original high dimensional is only artificially high: there is an intrinsic lower dimension to the data. i.e, the data "sits" on a lower dimensional manifold. A nice example to have in mind is consecutive photos of the same person: While I might represent each image in the number of pixels (high-dimension), the intrinstic dimensionality of the data is actually bounded by the physical transformation of the points (in this case, the 3D rotation of the head). In such cases t-sne works well. But in cases where the intrinsic dimensionality is high, or the data points sit on a highly varying manifold, t-sne is expected to perform badly, since it's most basic assumption - local linearity on the manifold - is violated. Before performing dimensionality reduction for visualization methods, always try to first figure out if there actually exists a lower intrinsic dimension to the data you're dealing with. If you're not sure about 1 (and also generally), it might be useful, as the original article suggests, to "perform t-sne on a data representation obtained from a model that represents the highly varying data manifold efficiently in a number of nonlinear layers, such as an auto-encoder". So the combination of auto-encoder + t-sne can be a good solution in such cases. Not the answer you're looking for? Browse other questions tagged clustering data-visualization dimensionality-reduction high-dimensional tsne or ask your own question. Why is multilinear PCA rarely used for nonlinear dimensionality reduction, compared to, say, t-SNE? How to correctly evaluate models after dimensionality reduction? What is the good use for t-SNE, apart from data visualization? Is dimensionality reduction considered to be primarily unsupervised learning? Why is t-SNE not used as a dimensionality reduction technique for clustering or classification?